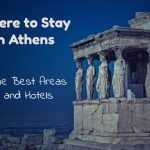 Athens is not only a stop-over for the famous Greek islands, or a 2-day short stay to see Acropolis, Plaka, and the Museums. 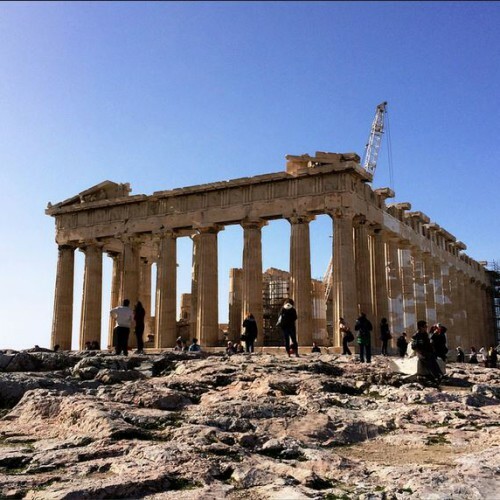 Athens provides you with an excellent opportunity to organize several day trips which may include sea, the greek islands, sailing, learning about history and ancient temples and gazing at amazing sceneries. We picked the ten best day trips you can organize from Athens. Corinth used to be the “Monte-Carlo” of the ancient Athens. A vibrant city, 100kms away from Athens, close to the sea, with a lot of commerce, fun, and even famous prostitutes, who were keen to try and indulge with their beauties the wealthy Athenians. The ancient Corinth was built on the top of a hill, and you will need around 1 hour and a half to get there from Athens. 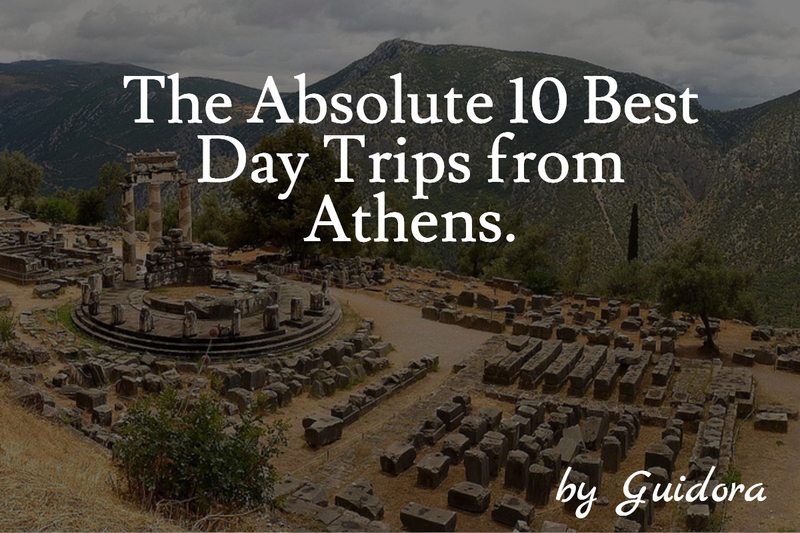 It’s a nice day trip but not on the top of our list, so don’t prioritize it if you don’t have many free days in Athens. 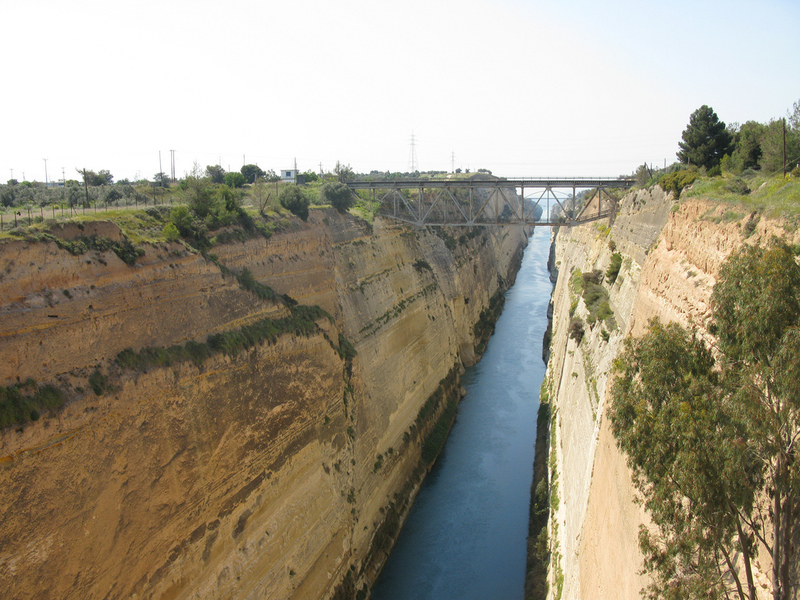 Starting from Athens, you will pass through the Corinth Canal. This is a Canal opened 100 years ago so that the boats could pass from the Corinthian bay to the Saronic bay. Thanks to this canal, the ancient Corinth was ruling the ancient world of commerce and was considered to be the richest city in the ancient world for quite some time. Now, you may ask yourself: “You told us that the Canal of Corinth was opened 100 years ago. How come the ancient Corinthians were making money from it?“. Well, the answer is called “Diolkos.” Diolkos was a paved road that started from the one side of the Corinth Canal and ended to the other end. The workers pulled the ship out from the sea, placed it on big trees and pulled them to the other side of the Canal. This was happening for thousands of years until the canal was excavated and a Seaway was opened. 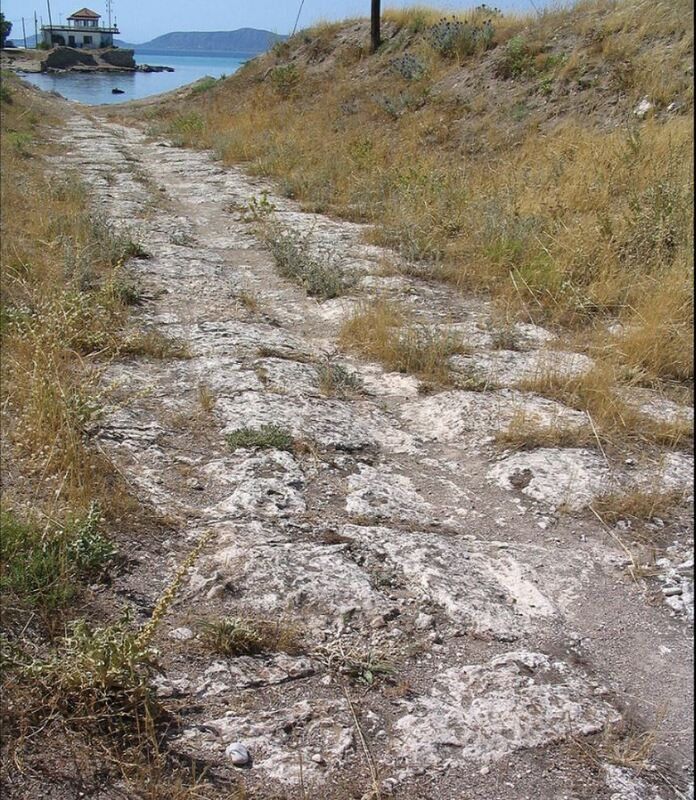 You can still see a part of this ancient road (Diolkos) in the Corinth Canal. Part of the ancient road (Diolkos) that was used to pull the ships from one side of the Corinth Canal to the other. The Greeks constructed this road around 700 years BC. In a day trip to Ancient Corinth, you should spend some time gazing at the Corinth Canal, then going to visit the Temple of Apollo, then paying a visit to the Archaeological Museum of Ancient Corinth and then return to Athens. You could also combine it with spending some time at Xylokastro if you want to enjoy the crystal clear waters of the Corinthian bay. The Archaeological Museum of the Ancient Corinth is inside the archaeological area of ancient Corinth. The most important things to see are a marble sphinx, mosaic floors and many coins and everyday objects from the ancient Greece. The entry ticket costs 6 euros, and it is open from 08:00 to 15:00. Below you can see a couple of photos with interesting exhibits from the museum. A day trip to Ancient Corinth costs around 60 euros per person and you can book a half Day Trip to Ancient Corinth here. Guidora’s View: We believe that it is an overkill to spend a full day for ancient Corinth. Don’t do it. Spend only half a day in Ancient Corinth (book it here), or combine it with Nafplio (for the romantic walks in this Italian-style city) and Mycenae (for the ancient monuments) or with Xylokastro (for the beach fun). Xylokastro is a beach town on the Corinthian bay, which is 140kms away from Athens and you can reach it in 1 and a half hours with a car. The Xylokastro town does not give you something special as an architecture but what you will enjoy are the small villages built close to Xylokastro (such as Likoporia, Pitsa, Loutro). These little villages have many traditional houses, with gardens full of lemon trees, just in front of the Corinthian bay and under some impressive mountains and rocks. 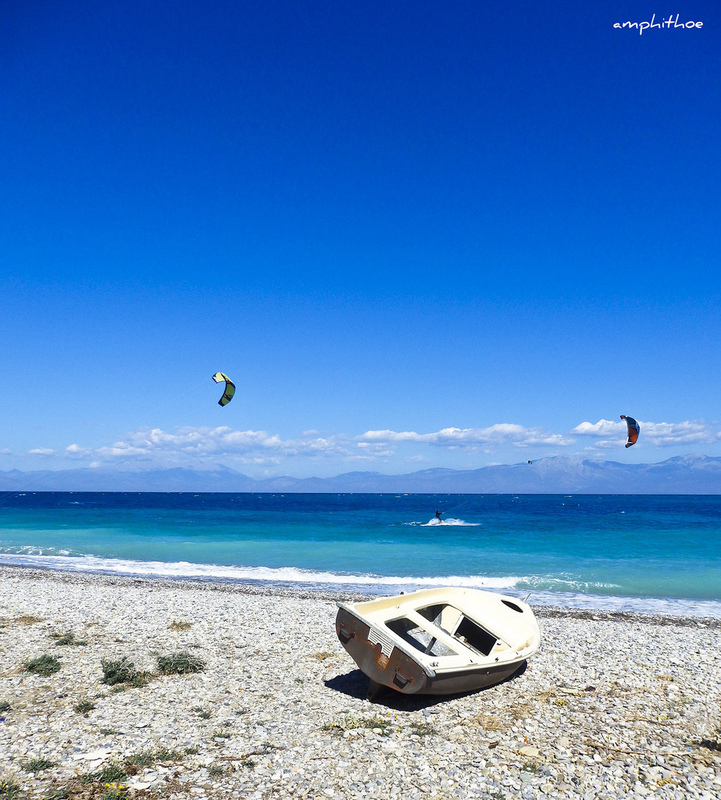 In Xylokastro area, you can enjoy several beach sports such as Kite, Windsurfing, SUP, Scuba Diving. In the middle of Xylokastro, you will find “Pefkias,” a forest just in front of the sea. You can just grab a seat at a beach bar under the trees and jump into the clear sea waters whenever you feel like it. There is no entrance fee for Pefkias forest. If you choose to sit on the sunbeds of a beach bar, you will have to pay for the umbrella set (be careful as in some places you may pay up to 15 Euros for two sunbeds and one umbrella). 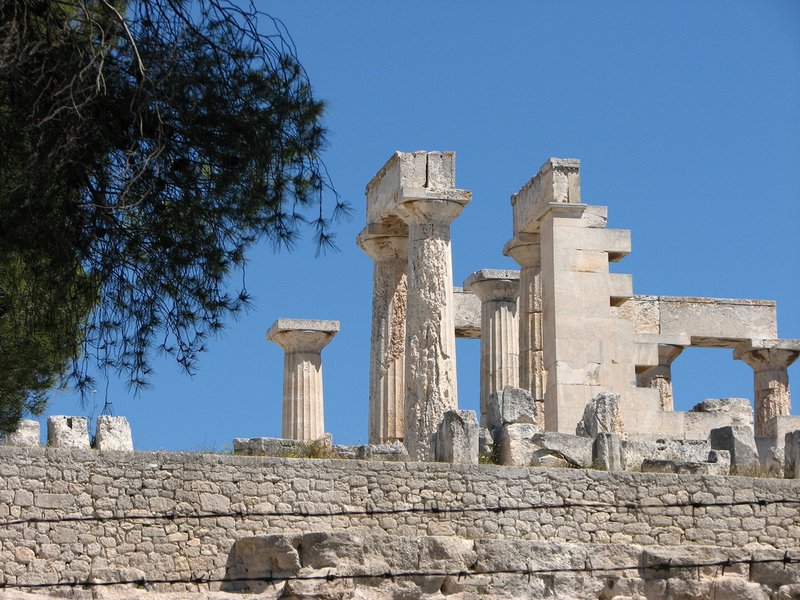 Guidora’s View: We suggest that you combine a tour to Ancient Corinth with a visit to Xylokastro. This is entirely possible if you start your day early. 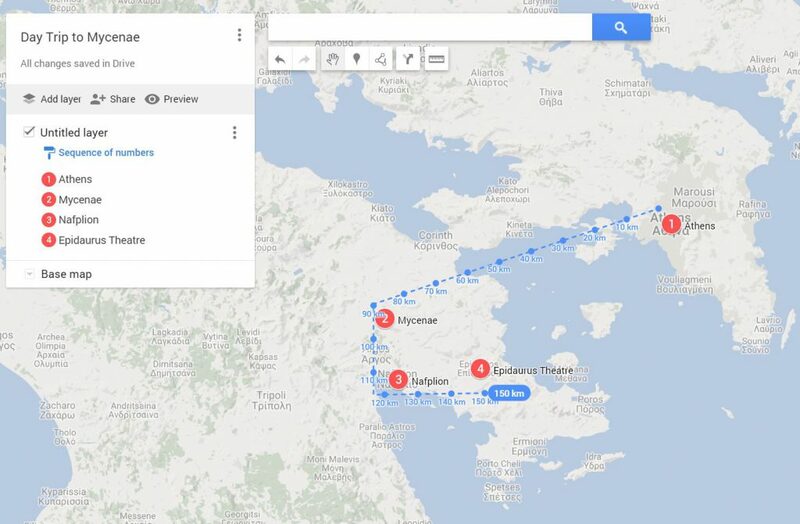 E.g., you can leave from Athens at 08:00, reach the archaeological area of Ancient Corinth at 09:15, spend 3 hours there, then transit to Xylokastro at around 13:00, spend another 5 hours and be back to Athens at around 19:30. 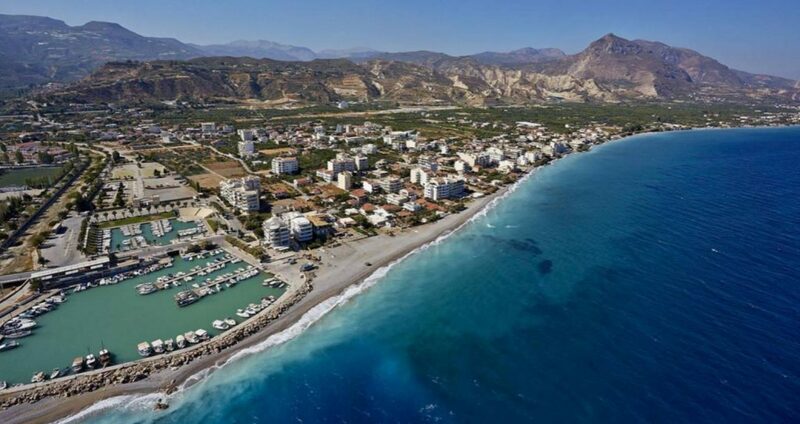 Xylokastro is the best area of the Corinthian bay for swimming, so avoid going to other areas such as Kiato, the Modern Corinth, Loutraki, etc. Unfortunately, there is no organized tour that we can recommend to you that goes both to the Ancient Corinth and to Xylokastro. If you feel like spending the evening in Xylokastro, the best hotel to stay is “Sikeon Resort” on the beach and almost inside the Pefkias forest. However, it is also the most expensive, so you should expect to pay around 120euros for a double room. 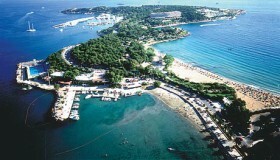 Aegina is an island in the Saronic Bay, which is 35 minutes away from Piraeus port of Athens if you take the fast boat. Alternatively, if you get the cheaper and slower boat, it will take you 1 hour and 15 minutes to get from Piraeus port to Aegina island. 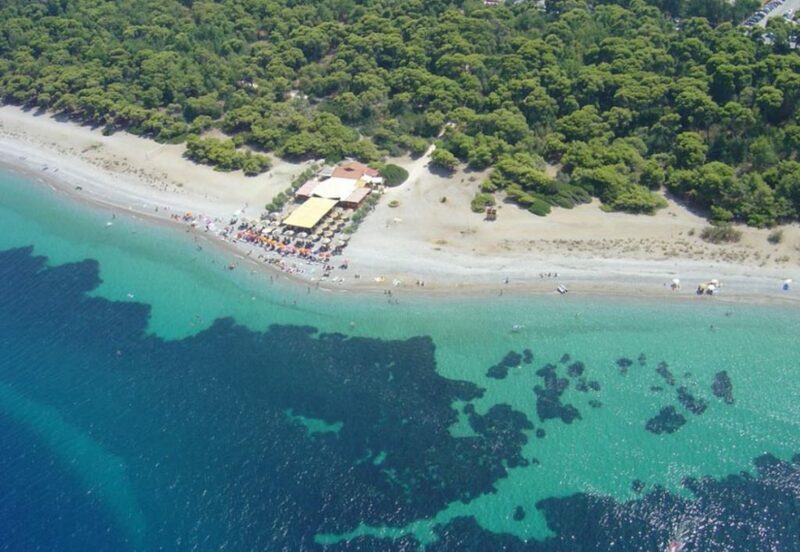 Swim in Agia Marina beach or in anyone else that you may find in the coastline on your way there. Enjoy the Greek food in the taverns and restaurants of the island. Search for “Nontas”, “Skotadis”, “Kappos Etsi”, “Kavouropetra”, “Dromaki”, “Babis”, or “Argiris”. Guidora’s View: We do recommend to spend a whole day in Aegina island if you are visiting Athens from May to October when the weather is nice. The sea water in Aegina is pretty cold until June, and it’s more convenient to swim from July until the middle of September. Of course, you don’t go to Aegina for the beaches. If you are looking for islands with fantastic beaches you have to go to the Aegean islands or the Ionian islands. Not to the Saronic islands. 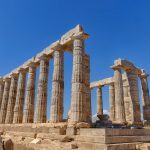 So, why bother going to Aegina? It’s pretty close; it has a beautiful town, decent beaches and you will enjoy a great day, without spending a lot of time to get to the island. 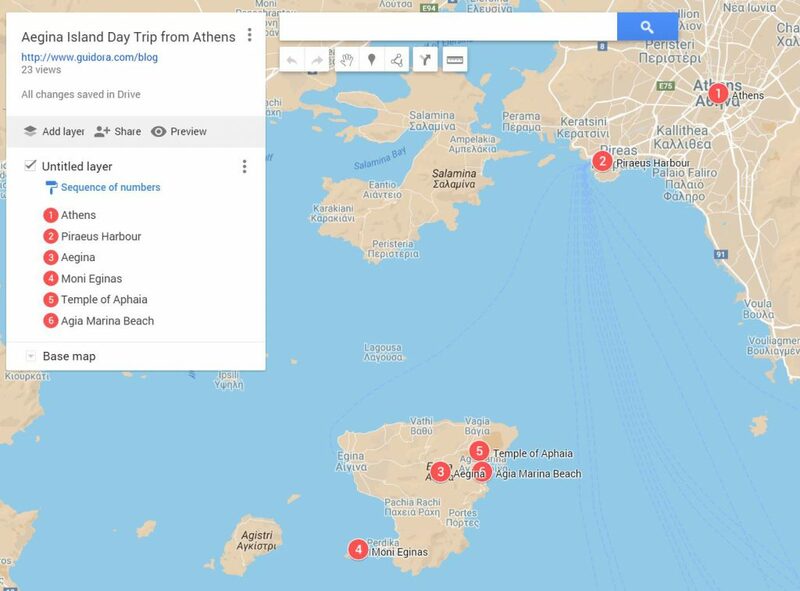 We also recommend that you get a tour to all 3 Saronic islands in one day – particularly if you don’t have so many free days during your visit to Athens. 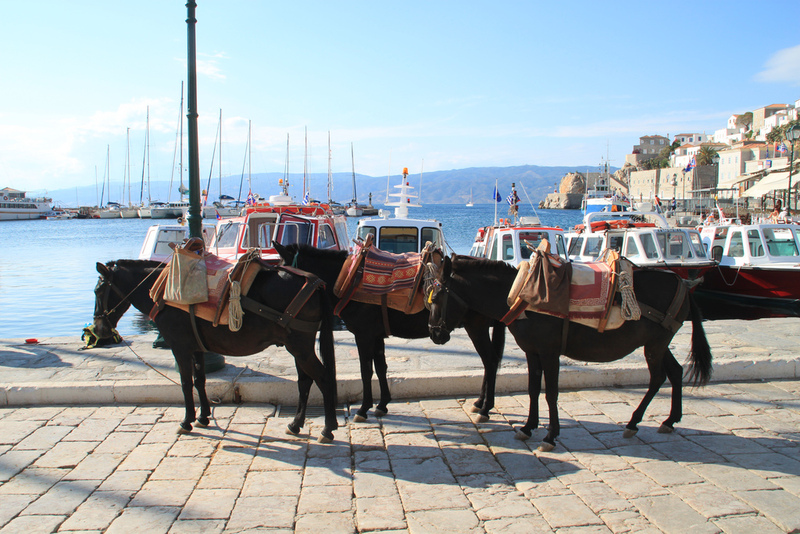 You can book a tour to Aegina, Hydra and Poros islands here. 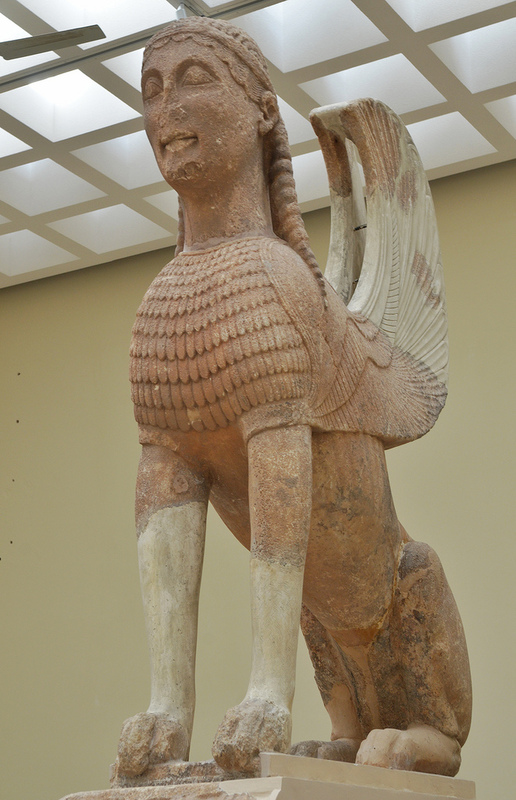 Mycenae was a very powerful city in Athens, especially during 1600 – 1100 BC. At its peak, 30.000 Greeks were living in Mycenae. The King of the Greeks, in the war of Troy, to get the beautiful Helen back to Greece, was Agamemnon, the King of Mycenae. 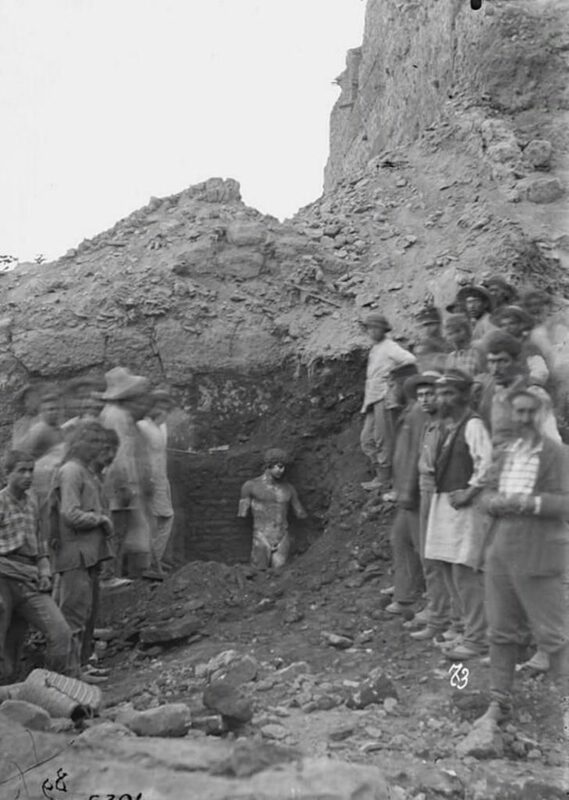 The whole area of Mycenae is being excavated during the past 120 years, and more and more exhibits come to light. An excellent company to a book a tour to Mycenae is this one, which offers a day trip to Mycenae, Nafplio, and Epidavros with around 70 euros per person. Guidora’s View: Don’t spend a full day in Mycenae. It’s a nice place but not for more than two hours. You will have to combine it with at least Nafplio to make the trip worthwhile – even better if you can combine it with Nafplio and Epidavros theater (don’t go the city of Epidavros, just visit the ancient Epidavros theater). Epidavros was a small city close to Mycenae, and it was the known as the healing center of the ancient world. The healing center was named “Asklepeion”. Everyone came to Epidavros to get cured, and this has brought a lot of wealth to this little place. Thus, a beautiful theater was constructed on top of a hill, which operates until today. 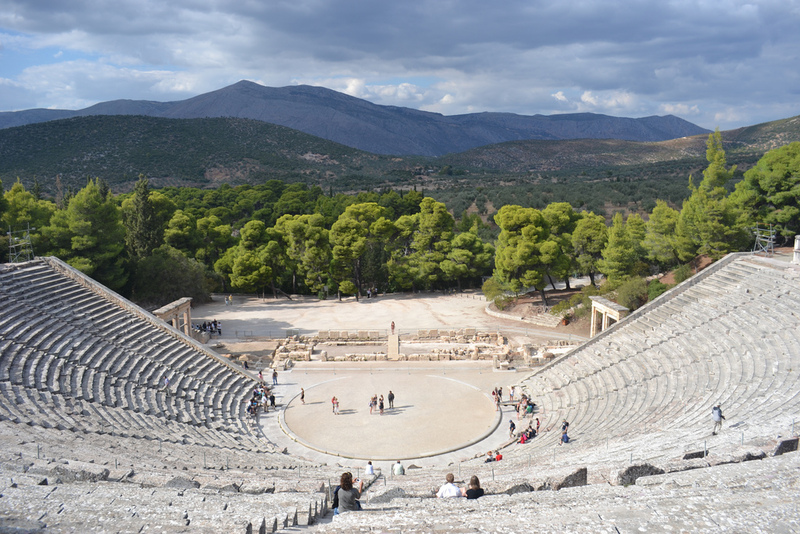 Don’t miss the opportunity to grab a ticket for the theater plays that are pretty popular during the summer season, as hoards of locals and tourists come to Epidavros theater to watch them. 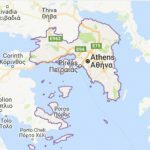 Epidavros is around one and a half hour away from Athens. An excellent company to a book a tour with to Nafplio is this one, which offers a day trip to Mycenae, Nafplio, and Epidavros with around 70 euros per person. 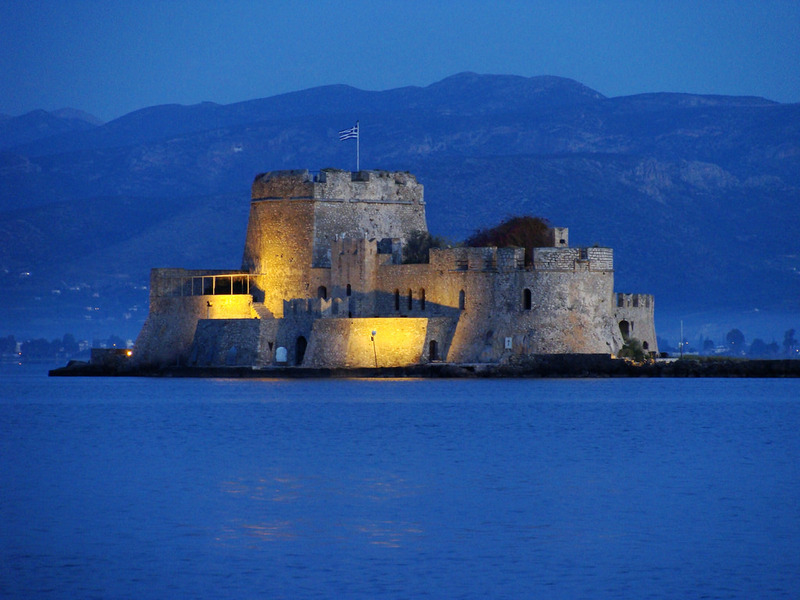 Nafplio is a seaport town in Peloponnese, around 1 hour and 15 minutes away from Athens. It was the first capital of the modern Greece. Due to its strategic location, it was conquered by Ottomans and by the Venice empire. 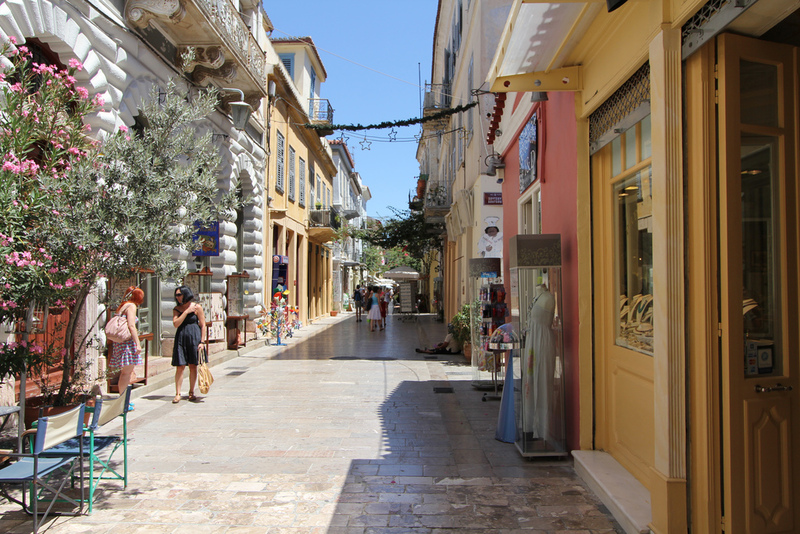 You know that Venice was the richest place on earth for a couple of centuries, so Nafplio has many buildings built with the Venice Architecture norm. It’s a romantic place to spend a day, strolling around in its beautiful streets and feeling a little bit like being in Italy. A nice company to a book a tour with to Nafplio is this one, which offers a day trip to Mycenae, Nafplio, and Epidavros with around 70 euros per person. Cape Sounio is 70 km away from Athens, and you can reach it in an hour, driving on the seaside road of the Athens Riviera. Sounio is famous for the Temple of Poseidon that resides there. Especially during the sunset, it offers a fantastic scenery. During the summer period, you can also swim in the beautiful bays that are close to the Cape Sounio or get a sailboat to cruise in its bay. The Saronic bay is the bay that starts just in front of Athens (Piraeus port). 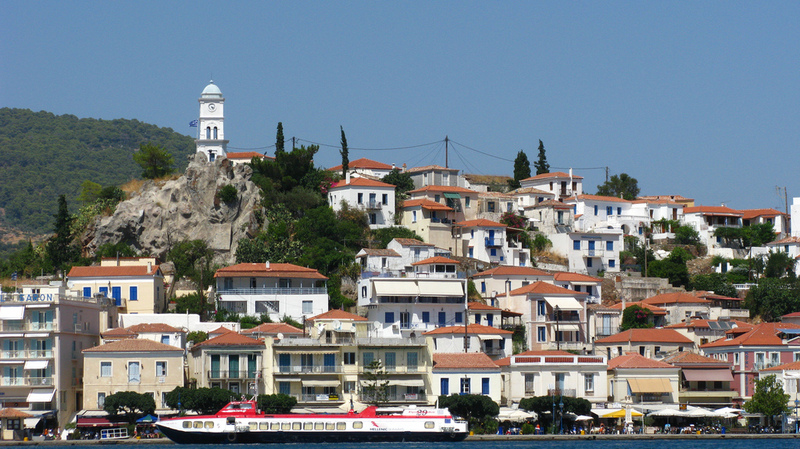 Its most famous islands are Hydra, Poros, and Aegina. If you have a couple of free days you can combine all three islands on the same tour and enjoy the Greek sea, sun, and food. Hydra island is the most popular island of the Saronic bay. It is a place where cars are not allowed and you can only move around the island on foot or by using the traditional donkey-operated vehicles. Hydra was once inhabited by the richest Greeks, mainly ship owners and it played a very critical role in the liberation of Greeks from the Ottoman empire, during the Greek Revolution which took place on 1821. In Hydra you will see many nice buildings, built 60-70 years ago, eat at traditional and elegant restaurants and jump into the sea directly from the rocks, as it doesn’t offer any sandy beaches. 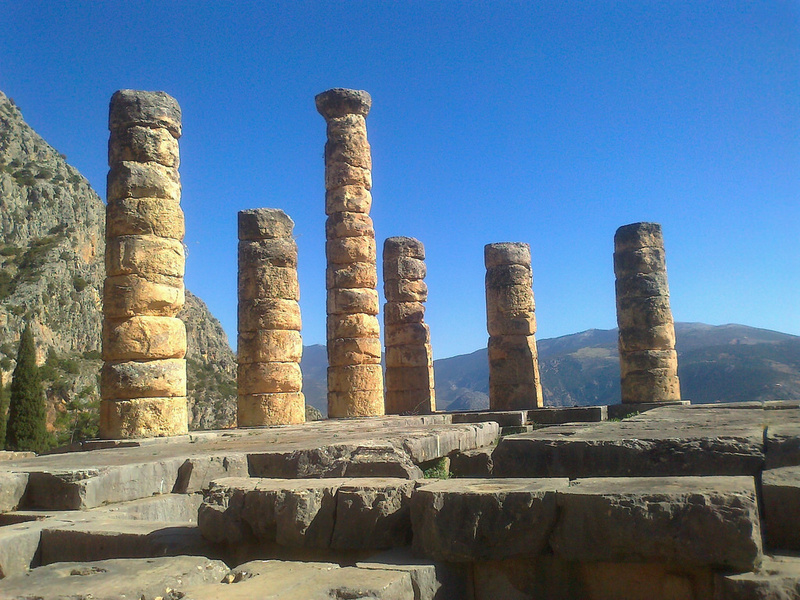 The History of Delphi: Delphi was the ancient oracle of Greece. Every important personality was visiting it to get the “orders and will of the twelve gods”. Delphi is built on the top of Mount Parnassos and there is an interesting legend on how this place was chosen. The legend says that God Zeus was looking for the epicenter of the earth to built this center. So, he sent one eagle towards the east and a second one towards the west. The point where the two eagles met each other was this place on the top of Mount Parnassos. And Zeus order to have Delphi built there. How to Get to Delphi: You can book a one day tour to Delphi here. 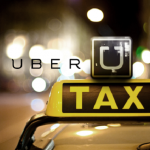 The cost per person is usually around 70 to 90 euros. If you choose to go on a day trip from Athens to Delphi with a tour or with your own rent-a-car, you should plan for a 10 hours total duration of the trip. Delphi is around 183kms from the center of Athens and you will need 2 hours and 10 minutes to reach it. So, that’s a total of four and half hours in the day on the road. In the remaining six hours, you will see the temple of Apollo, you will explore the ancient ruins of Delphi, you will visit the museum of Delphi and you can also go to the beautiful village of Arachova. Arachova is 10kms from Delphi and you will need 10 minutes to drive there. 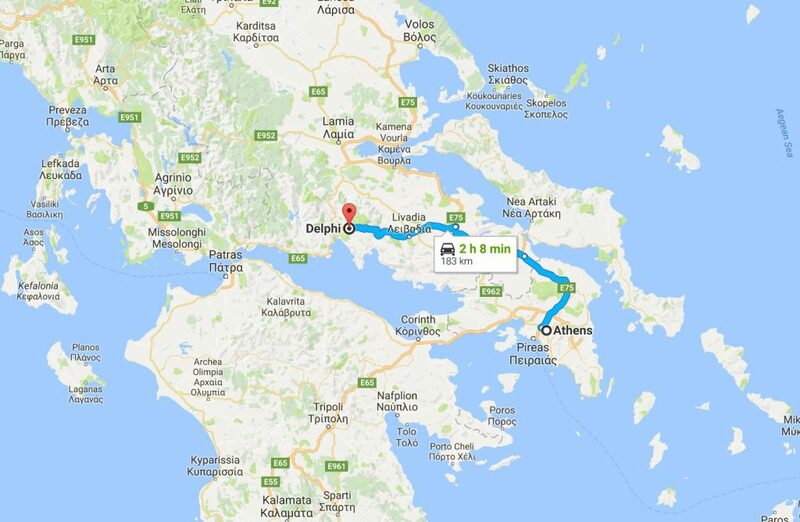 Day Trip from Athens To Delphi – Distance is 183kms and you will need 2 hours to get there. 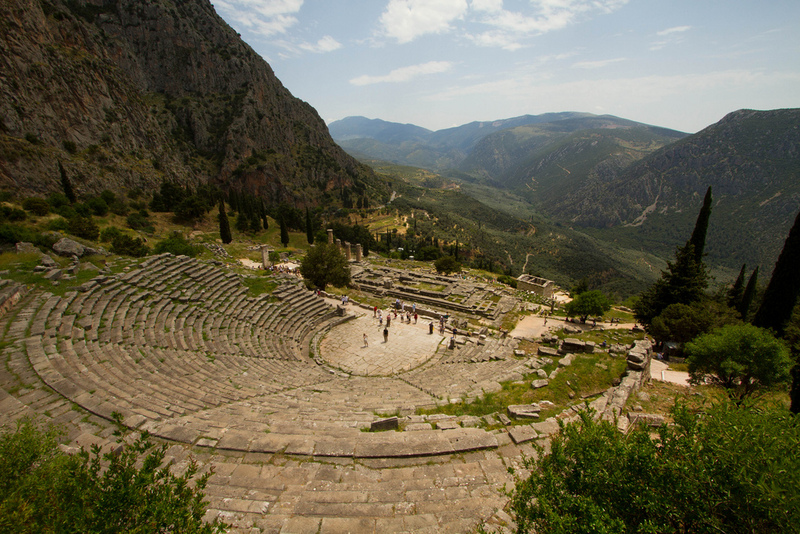 What to see in Delphi: First you should go and visit the ancient theater of Delphi, which is on top of the Mount Parnassos and provides an excellent view of the surrounding mountains. 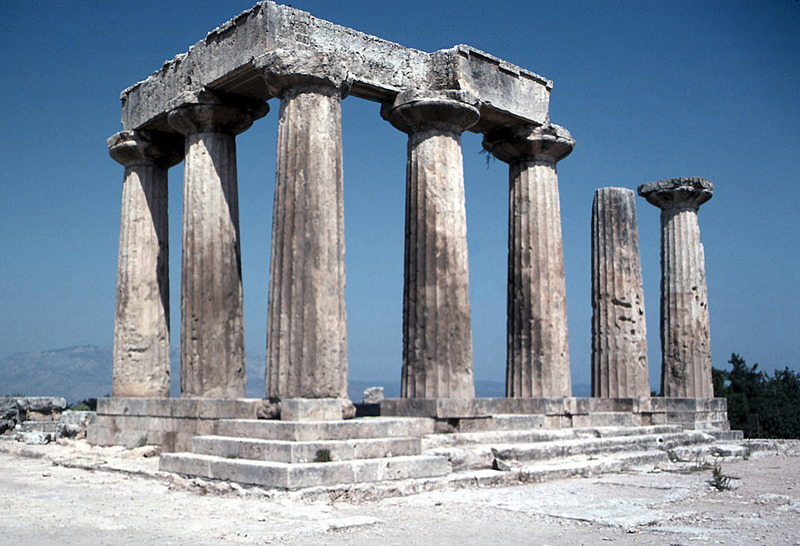 The next thing to see should be the temple of Apollo, which is the most famous temple in ancient Greece since it had the Oracle of Pythia. 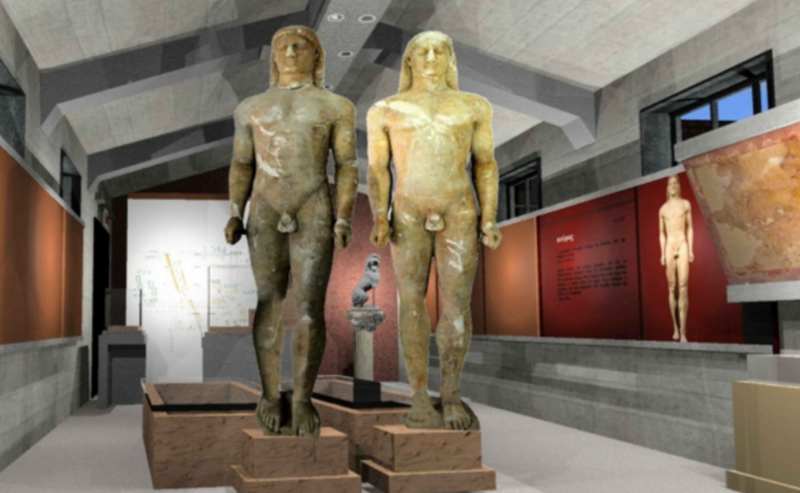 Your next stop should be at the Museum of Delphi, which is next to the archaeological area – you there on foot. This museum has 3 famous exhibits that you should pay attention to. The first exhibit is the Charioteer of Delphi, which is the best-preserved bronze statue from ancient Greece, surviving since 450 BC. 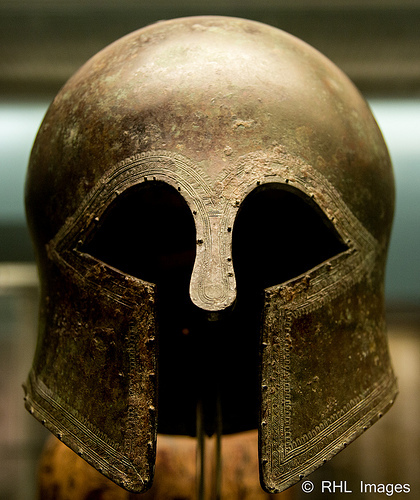 That was a present to the gods from a Tyrant in Sicily, for his victory in a battle. The towns in Sicily were very wealth that period and their rulers could afford expensive gifts to the gods, to gain them on their side. This is an impressive 1.8 meters bronze statue, which is of fine art. 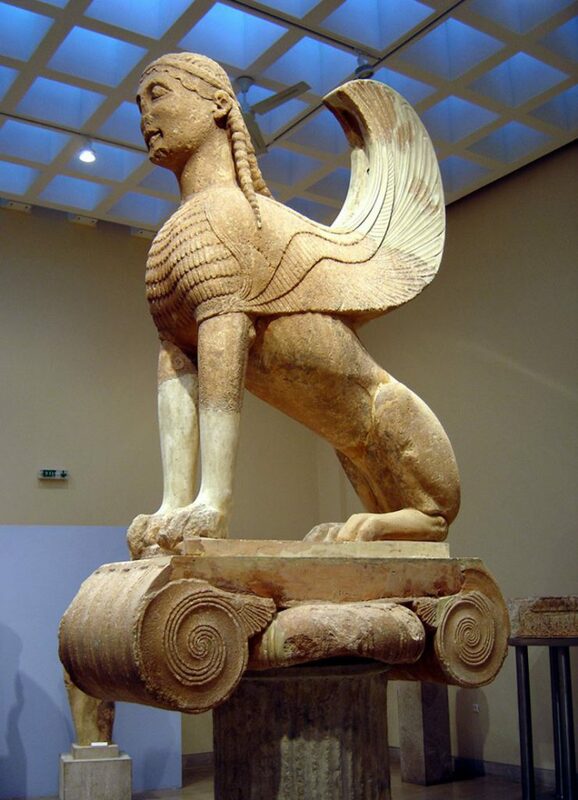 The second famous exhibit is the Sphinx from Naxos island. Naxos island was also quite rich at 500 years BC. And they wanted to make a gift to the gods, at Delphi. So, they gave them the Naxian Sphinx, which represents a legendary creature with the body of a lion, the head of a woman and feathers. They placed it on a column and the total height of the column plus the sphinx was 12.5 meters! Your last stop of your day trip to Delphi should be your visit to Arachova village, 10kms away from the oracle of Delphi. Arachova is the most famous winter destination for people from Athens, as it is close to the snow center of Parnassos. All the high-class, rich Athenians are going to Arachova every winter to enjoy life in a chalet, do some snowing, eat at the traditional restaurants of the village and enjoy a quite vivid nightlife. 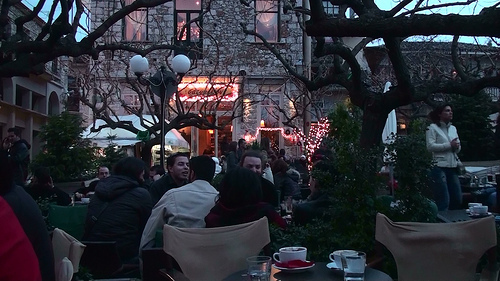 Some say that Arachova is the “Mykonos of the winter” in Greece. When you go to Arachova, try the cheese, which is called “Formaella“ and the local wine which is pretty intense in its flavor. Go to a greek taverna and try some lamb chops (“paidakia in greek”), greek salad, and traditional local dishes. After that, you can drive a couple of hours and get back to Athens. The road is a toll road and they don’t accept credit cards, so make sure you have enough cash on you, as the tolls should cost around 10 euros from Arachova to Athens.